On Sunday mornings I usually get up around 9 am and hesitantly approach my letterbox with a degree of trepidation. My normal Sunday papers were the Sunday Herald and the Sunday Post. A week or two back I was so incensed by the Sunday Post cartoon showing Alex Salmond in the dock being grilled by a scholarly legalistic Alastair Darling, that I cancelled that paper. It had been my parents’ choice in my younger days, and after I got married I just carried on; as my sons grew up they avidly scanned the football pages. So after probably over 60 years readership (these last 10 years or so I just glanced at it) it had finally exhausted my patience and tolerance. I write of approaching with “a degree of trepidation”, and I did this with the Sunday Herald every week, half dreading what they would come up with. I make this point as I did not see the Sunday Herald as a natural supporter of independence; it had some columnists who were independence minded, but also some who seemed mired in the No swamp. Editorials were balanced in the main but, as they say “not likely to miss and hit the wall”. So I was astounded and thrilled to see the front page on Sunday 4th May 2014, and profoundly impressed with the accompanying editorial. 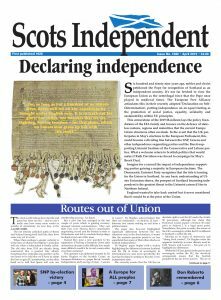 The significance of this is still sinking in; a major Scottish Sunday newspaper has come out not supporting the SNP or waffling about many of the devo illusionary plans, but making the case for independence – “The prize is a better country. It is as simple as that.” The editorial says it all. One steady tactic for the opposition (small “o” ), has been to demonises Alex Salmond. Their aim is simple, they see Alex as the chief proponent and the biggest asset for the Independence campaign, so any harassment, lie , distortion, miscalling is par for the course. It reminds me of the piece by Jimmy Halliday in last week’s Flag; he referred to the opposition and their “peevish greeting faces”, and how accurate that description is. Twice, during the Dunfermline by election ( I was away on holiday for Cowdenbeath) I met men, my age group who had very unkind words about our First Minister; if you wonder at only two I was leafletting nearly all the time so did not engage with the electorate much. Anyway both men said “He tells lies”. I then asked them to tell me of one, and neither of them could. They believe Johann Lamont; they don’t know her name or virtually anything about her, but the message that Alex Salmond tells lies is repeated so often. I think we should remove parliamentary privilege so that comments and accusations can be properly contested in a court of law. After all, any accusations against the First Minister have been disproved on investigations, which themselves means charge to the public purse for nothing. Time other politicians were also investigated. As in the first item, who would be standing in the dock then? sake don’t tell them! Mind you I believe in telling everybody else. I have now been a member of the Scottish National Party for 48 years; never in my life have I seen anything like the Yes campaign; independence is the issue for people of all political parties, and as far as I can see, a great number from no political parties. It is humbling, and very heartening to this grizzled old Nationalist, what we always dreamed about is happening on our doorstep. As the Referendum gets nearer disquiet is being voiced by the “peevish greeting faces” about various elements who may support Yes, and are thus entitled to spend money. Strange allegations are flying about, the Scottish Independence Convention has been named for one; that is palpable nonsense, they have been in the fight long before the Yes campaign, I remember being at the inaugural meeting. National Collective is another, which has very loose links to Yes, and there are others all keen to play their part in their nation’s future. On the No side, we could line up the Daily Record, the Daily Mail, the Scotsman, the Telegraph, the Press & Journal, the Courier and the Sunday Post with a smidgin of doubt about the Sun, which may see advantages by backing Yes. Who knows? A favourite question at our public meetings used to be “What will happen to the SNP if you ever get Home Rule?” The intention was to embarrass, because underlying the question was the assumption that once the Party’s goal had been achieved the very reason for its existence had disappeared. Friendly or hostile, many agreed with this reasoning and many members had always regarded their membership as temporary. With Home Rule their commitment would end and they would be free to busy themselves in pursuit of lesser, more materialistic aims. Members agreed that the SNP was not “just another Party”. Indeed quite often dissidents would attack Party officials precisely because they were, allegedly, making us look like “just another Party”. So, though it would astonish most fellow members to-day, a very large number then believed that the victorious Party should simply disband. It was easy to understand their attitude while the whole notion of independence seemed so remote. But, as the passing years began to make prospects more encouraging, we began to have second thoughts. Was it really sensible to see a newly free Scotland handed over to be administered by the very politicians who had struggled to the very last moment to prevent independence happening at all? What loyalty to Scotland was to be expected from persons who until that moment had shown none? How far would they instead do all they could to sabotage the infant Scottish state, hoping to prove that they had been right when they dismissed freedom as ridiculous and impossible? Remember, our starting question can still be asked, because we are some way from independence yet and we are still to give our final answer. We do, however, have new experience to guide us. How unionists have handled devolution can serve to suggest how they would handle independence. They have co-operated, but only perhaps because they remained in charge until recently. Co-operation in time of independence cannot be assumed. We were lucky in having Messrs Dewar, McLeish and McConnell. Consider what might have been. Lord George Foulkes perhaps? Mr McAveety? Any of the furious fishwives fulminating on Labour’s benches? And if Holyrood did not produce a sufficiently convincing First Minister could the net perhaps be cast more widely to summon an MP to the aid of the Party in Scotland? Once upon a time Robin Cook was suggested for such a role. If only. Now we might think of Mr Connarty, Mr Joyce, Mr Browne, Mr Donohue, or, as Burns might put it, “Mair o’ horrible and awful’”. Labour’s present incumbent, Mr Gray, seemed to deserve a courteous welcome. He was from the east, and did not conform readily to the caricaturists’ Mafioso of the urban west’s unhygienic political machines. It has come as a disappointment therefore to find him demeaning himself with some serious overacting. Bogus rage, contrived indignation, do not encourage observers to rate very highly a man’s potential for maturity and integrity. On the contrary, they indicate an adolescent “putting on the style”. Mr Gray’s theatrical tearing up of the SNP’s manifesto was amateur dramatics at their worst and therefore funniest. Mr Gray was not the first man nor will he be the last to be tempted into overblown showing off when encouraged by the evident admiration of giggling girls. His histrionics were matched by enraptured fascination as displayed by Ms Brankin. Holyrood’s gain has been RADA’S loss. We look forward to Ms Brankin’s further auditioning and perhaps Mr Gray’s more testing attack on a telephone directory. While all this nonsense has commanded attention we have been reminded how much work remains before we can anticipate independence. Whether by election or by referendum or by combinations of pressures we need first of all to have behind us a supportive population. The recent exposure of the documents relating to the politics of 1979 ought to have aroused in all Scots a barely governable rage. They were, as we have always known, cheated, swindled and exploited beyond belief. Politicians and civil servants alike lied, distorted, evaded to their hearts’ content, secure in their power. They felt no risk in their contempt for the subject people who seemed neither to notice nor to care as even boundaries were shifted to and fro. It is a measure of Scotland’s tragedy that since this news broke neither politicians nor media have urged a Scottish response. We are in these devolved times, living through a long rehearsal preparing for independence. Just how long no one can say. But our performance during rehearsal will make our audience more ready to accept us as serious performers when the real show starts. We can now offer a new answer to the old question about the Party’s future–Trust us to govern because we have shown we can. Next Post: Project Fear or Project Feart?